Minor metals are essential to the metal industry and are used in modern products such as rechargeable batteries, photovoltaic cells, and structural materials. Products containing minor metals eventually become waste, and such waste is produced in large amounts in urban areas. Industrial wastewater is usually discharged without minor metals being recovered from it. It is necessary to recycle them to move toward a sustainable society. Biotechnology using microorganisms has been used to recover metals from wastewater. Biomineralization (the production of minerals by organisms) is one such technique. 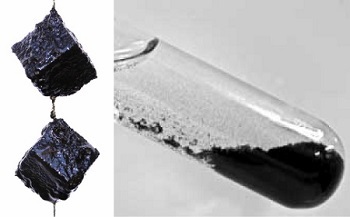 Manganese-oxidizing bacteria (MnOB) can produce manganese oxide. Biogenic manganese oxide (BioMnOx) can efficiently adsorb various minor metals. The production of BioMnOx in reactors to remove metals during wastewater treatment processes is a promising biotechnological method. However, it was difficult to preferentially enrich MnOB to produce BioMnOx during wastewater treatment processes. The research group of Professor Akiyoshi Ohashi has proposed some unique methods of cultivating MnOB. The research group has succeeded in enriching MnOB and demonstrated that minor metals were efficiently removed and recovered from wastewater by a cost-effective DHS (Down-flow Hanging Sponge) reactor at a high rate (Fig. 1). Through this research, surprisingly, they found MnOB can be also applied to persistent dye wastewater treatment. In biological wastewater treatment, high biomass retaining reactor is very important. The research group has been developing DHS as a novel, cost effective and low energy consumption biological sewage treatment reactor for developing countries. A pilot plant of DHS reactor had run in India to investigate the reactor performance for more than 10 years (Fig. 2). Now, DHS reactor is established, and the world’s first full-scale DHS reactor was installed in Agra, India, in 2014. The group focuses on the application of DHS reactor because it is very attractive for not only sewage treatment but also recovery of resources from wastewaters. Shuji Matsushita, Daisuke Komizo, Linh Thi Thuy Cao, Yoshiteru Aoi, Tomonori Kindaichi, Noriatsu Ozaki, Hiroyuki Imachi, Akiyoshi Ohashi. Production of biogenic manganese oxides coupled with methane oxidation in a bioreactor for removing metals from wastewater, Water Res. 130: 224-233. 2018. Cao T. T. L., H. Kodera, K. Abe, H. Imachi, Y. Aoi, T. Kindaichi, N. Ozaki and A. Ohashi. Biological oxidation of Mn(II) coupled with nitrification for removal and recovery of minor metals by downflow hanging sponge reactor. Water Res. 68: 545-553. 2015.